The mighty Symmetric Orchestra just finished four sets in two nights at the Dakota. Ancient instruments (kora, balafon, ngoni) were enhanced with modern (drum kit, electric guitar and bass) playing 700 year old West African music. The timeless Mongo Santamaria composition as performed by the John Coltrane Quartet (JC with McCoy Tyner, Elvin Jones and Jimmy Garrison). From Ralph J. Gleason’s Jazz Casual TV show. Curtis Mayfield back in the day. I can’t get enough of his music, and here’s a link for more. Part of the Tough Guys DVD box set (now reissued as Gangsters Volume 2), this 1940 Warner Brothers obscurity is a taut bundle of New York City energy with a big heart. 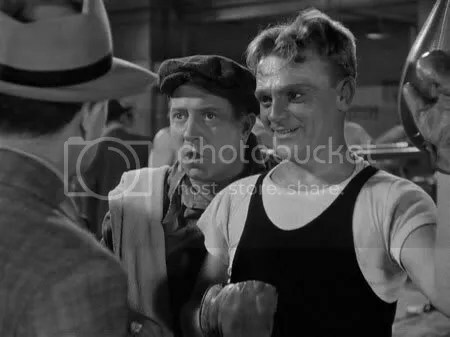 James Cagney shows restraint and depth as a moderately ambitious fighter whose middling success is overshadowed by his longtime love’s sudden fame as a dancer. The acting is sympathetic from top to bottom. Elia Kazan, in a choice role as a childhood crony of Cagney’s character, doesn’t waste the opportunity. Anthony Quinn is a little stiff (he somehow made it work for him in La Strada) as Cagney’s slick rival but he has pretty good moves on the dance floor and Ann Sheridan does a nice job as the conflicted Peg. The bustle of late 30s Manhattan provides the backdrop throughout this lovable melodrama. Courtesy of Boing Boing, we share with you this helpful instructional video from Finland. Some vintage heat from the godfather of soul. (Papa Don’t Take No Mess/My Thang). Prime era JBs funk to kick off the weekend. 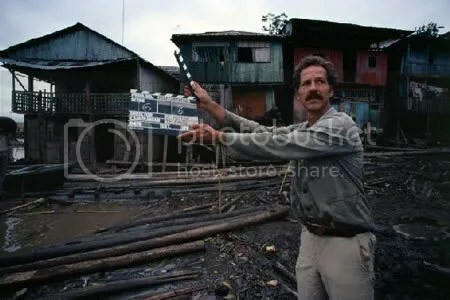 Tom Sutpen, over at the superb visual blog If Charlie Parker Was A Gunslinger, has posted a stunning portfolio of photos of directors at work with shots of everyone from DW Griffith to Werner Herzog (pictured above) on the job. Back in the late 80s and early 90s Joe Boyd put together some musicians from Spain, Mali and the UK and released two records by them under the name Songhai. 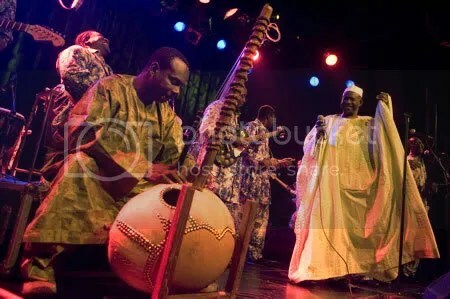 The group blended the flamenco of Ketama with the dazzling kora playing of Toumani Diabate, with the great British bassist Danny Thompson thrown in to anchor the whole thing. The result was sublime (check out the clip of “Jarabi” above). NB: Toumani Diabate will be on a short American tour (including 2 nights in Minny!) with his amazing Symmetric Orchestra. Miss them now and regret later. Does anyone who is not in the music business care about the fate of the music business? There’s been an enormous amount of hand-wringing within the industry not only about the purported Death of the CD (is a format that sells 500 million units a year dead?) but a dread that the music business as they’ve always known it is not long for the world. As Lefsetz says: The dropoff in sales is more due to lack of enthusiasm for today’s top artists than any diminution of people’s need for music. The marketplace is extremely fragmented today and I think in a way that’s healthy. What kind of music do you like? It’s out there if you care to look for it. 5. A frightened consumer is not a happy consumer. I shouldn’t have to say this, but here goes: suing people is like going to war. If you’re going to go to war with tens of thousands of your customers every year, don’t be surprised if they start treating you like the enemy. The RIAA and the major labels are still fighting a war that actually ended a long time ago. Artists have been figuring out how to bypass the major label structure and reach their fans directly. That can only be healthy for the “music business” (a term that is becoming more mutable by the second). You are currently browsing the Surface Noise™ blog archives for January, 2008.